Bad clutch symptoms come in different forms—from odd sounds, to poor performance, to mechanical problems. The source of any of these symptoms can be hard to recognize. Problems with the clutch disc itself or its related parts can cause many symptoms. Your car may function poorly: it may start out slowly even though the engine is racing. Or it may be hard to get the car into reverse, or into gear at all. Noises may indicate a problem: your clutch pedal may make noise, or your transmission may make noise when the car is in neutral. You may hear squealing or growling when you push the pedal or grinding sounds when you shift gears. The pedal may give you a clue: it may vibrate, chatter, or pulsate, be stiff and hard to push, fall to the floor and stay there, or feel loosely connected or "spongy." Below, I discuss all these symptoms and tests you can do yourself to diagnose them. A clutch can last 50,000 to 100,000 miles (depending on make and model), but clutch service life is greatly affected by stop-and-go city driving, frequent pulling of heavy loads, and "riding the clutch" (resting your foot on the clutch pedal while moving down the road). And when your clutch fails, it can be difficult to find the cause. But usually, paying attention to tell-tale signs like noises, clutch pedal behavior, and clutch performance will help you locate the likely source. Using those symptoms, this guide helps you diagnose the most common clutch problems so that you can make an informed decision about your repair. Look for your question below. This is known as clutch slippage. As you release the clutch pedal and accelerate, the vehicle moves slowly while the engine races, usually in high gear. Slipping is common when a clutch disc is worn out. 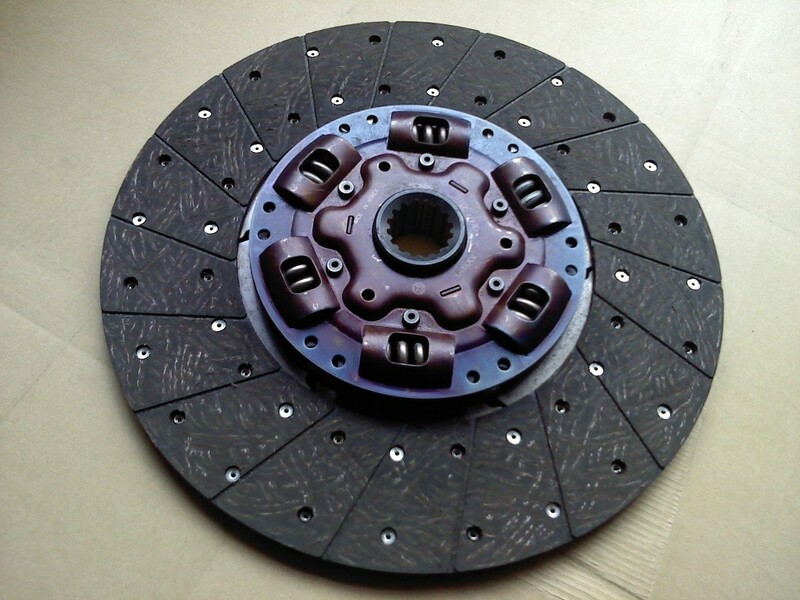 With the friction material almost worn away, the clutch disc has less surface with which to grip the flywheel and pressure plate, making it hard for the engine to transfer rotating power to the transmission. Another symptom you'll notice is the clutch releasing sooner, without much pressure on the clutch pedal. Note: If you just replaced the clutch (assuming that everything was reinstalled correctly), you may need to give the new clutch time to fully seat. Usually, you need to go easy on the clutch for the first 200 miles. To find out if your clutch is slipping, park in an area with enough space in front of you, away from traffic and people. Start the engine and engage the emergency brake. Shift into second or third gear and rev the engine to about 2500 rpm. Slowly release the clutch pedal. As the clutch engages the flywheel and pressure plate, the engine should stall. If the engine doesn't stall, then the clutch is slipping. Clutch problems can also prevent you from getting into or out of reverse or third gear. A stuck gear may indicate problems with the linkage adjustment, a linkage malfunction, or a warped or damaged clutch plate. On a hydraulic system, failure to get into gear may indicate problems with the master or slave cylinder or both. Usually, this is accompanied by a change in the way the clutch pedal feels: spongy, loose, or not catching as before. On a mechanical system, you may be having problems with the clutch disc or pressure plate, release lever, release bearing, shift lever assembly, or control cable. With the engine off, you can hear a noise when you depress the clutch pedal or release it, or both. Usually, the noise comes from the clutch release mechanism. The release device can be hydraulic (as in many modern vehicles) or mechanical. The device is likely to become noisy as lubricant dries out and the mechanism wears down. A cable, rod or connection may begin to scrape, squeal, or clunk. First, you need to locate the source of the noise with the help of an assistant. With the engine off, have your assistant work the clutch pedal. Open the hood and use a mechanic's stethoscope or a length of rubber hose (a vacuum hose will do) to listen closely along the release mechanism. Your vehicle repair manual (Haynes is a good aftermarket manual) can help you locate components. If the car is noisy when the transmission is in neutral, but the noise goes away when you depress the clutch pedal, it's possible the noise is coming from a worn-out input shaft bearing. As you begin to disengage the clutch—that is, as you start pressing the clutch pedal—you may hear a squealing or chirping noise. This usually points to problems with the release (throw-out) bearing. The release bearing can be worn out, the internal lubricant dried out, or the bearing itself damaged. Another potential source of trouble is a crankshaft pilot bearing. A pilot bearing that is worn out or damaged can squeal or grind when the clutch pedal reaches the floor. This is because the pilot bearing leaves a gap large enough for the transmission input shaft and clutch disc to vibrate. So you can tell whether the release bearing or the pilot bearing is the source of the noise. A bad release bearing will start squealing or chirping with a slight depression of the clutch pedal, or before it's fully depressed; a bad pilot bearing will start squealing or grinding as the pedal reaches the floor. So check the pilot bearing carefully if the clutch release bearing seems in good condition. This problem is known as a dragging clutch. It happens when the friction or clutch disc remains engaged or stuck, so the transmission input shaft keeps spinning even when you fully depress the clutch pedal. Since the input shaft is still spinning, trying to shift gears, specially into reverse, will cause them to clash or grind. This grinding may point to any number of problems: problems with the pressure plate, throw-out bearing, or release mechanism. On a mechanical release system, the cable may be broken, frozen, overstretched, or in need of adjustment (consult your vehicle repair manual). On a hydraulic-type system, grinding may indicate problems with the clutch master cylinder (low fluid, or air in the system or the internal cylinder mechanism). Another possibility you want to look into is the clutch pedal assembly. The pedal may have too much free travel and will need adjustment (consult your vehicle repair manual). This clutch problem makes the pedal vibrate or, if the problem is severe enough, makes the car jerk during acceleration. The vibration comes from the clutch disc intermittently losing its grip on the flywheel. Note: Before you go to the trouble of dropping the transmission, make sure to check the engine and transmission motor mounts, because motor mounts can also be the source of chatter. Check the mounts for cracks, damage, or loose bolts. Also, check that the transmission is correctly aligned with relation to the engine. 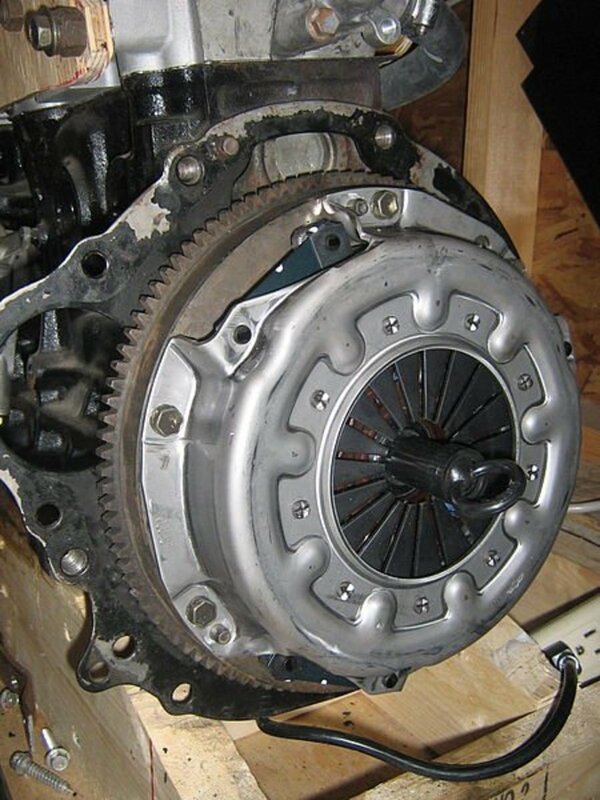 The transmission clutch housing should be resting fully against the engine; otherwise, this can cause vibration and lead to damage to the clutch disc lining and torsion springs. Park in an area with no traffic and no people around the vehicle. Fully depress the clutch pedal. Race the engine to about 2000 rpm. You should feel the clutch pedal vibrate as the clutch starts to engage the flywheel (engine). If you don't, the clutch disc is not the source of the vibration. 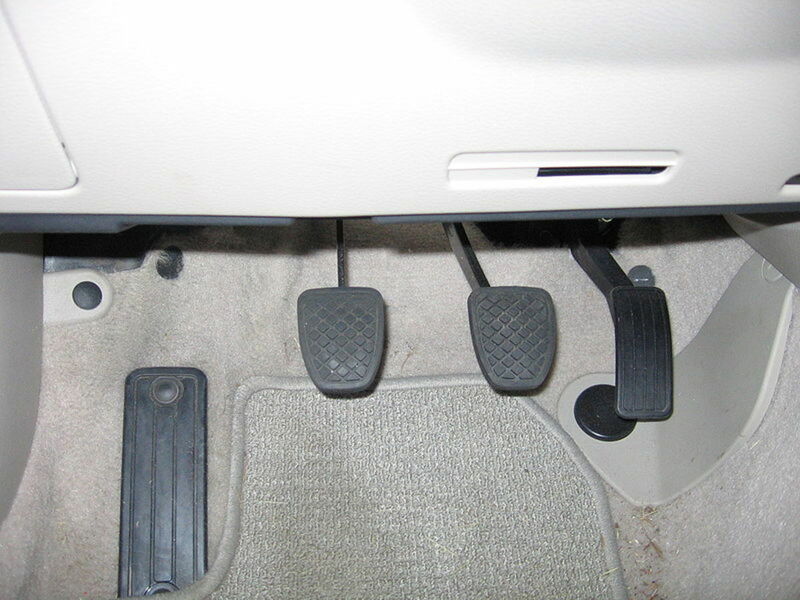 A clutch pedal may pulsate because a rotating part is wobbling or vibrating inside the transmission. The pulsation may be caused by a warped flywheel, or by a release lever that needs adjustment or is damaged. 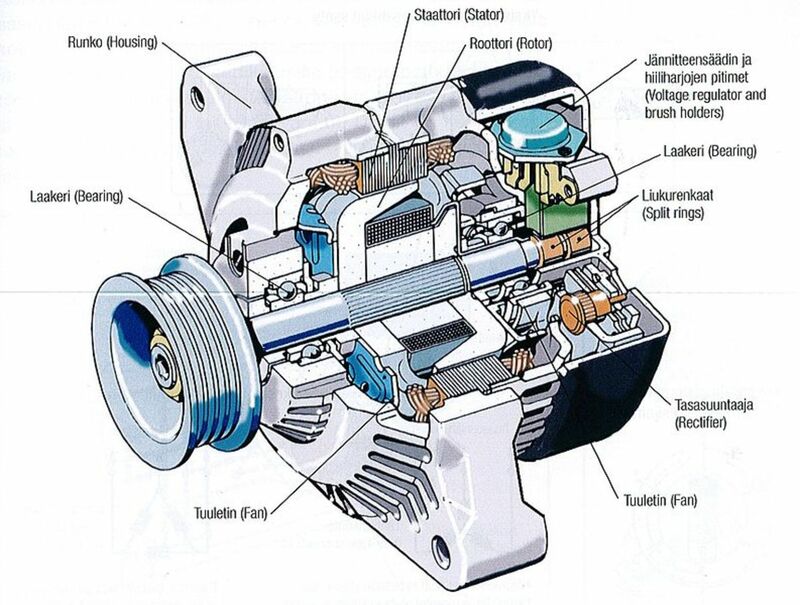 Note: If the pulsation or vibration started after servicing the transmission (the transmission was dropped or just separated from the engine for inspection), it is possible the transmission housing is improperly aligned with the engine. A clutch pedal that's hard to push or "stiff" may point to problems with the release mechanism (or the hydraulic system, on modern vehicles). Release mechanism components to check include the cable, linkage, clutch fork, pressure plate, and throw-out bearing. Check for a part that is in need of lubrication or worn out. Consult your vehicle repair manual for the maintenance service the system needs. Just like a stiff pedal, a clutch pedal that stays on the floor can point to problems with the linkage or release bearing. Either component may bind. Check that the springs in the linkage are not over-stretched. You may need to adjust the linkage. Also, check that the pedal stop is in place, and, if necessary, inspect the release bearing. Check the release bearing or fork for damage. 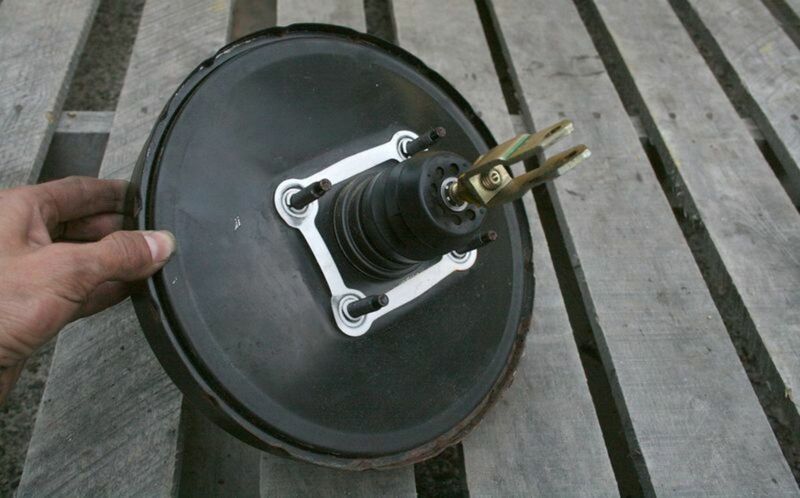 Check for a failure of the pressure-plate diaphragm spring. Consult your vehicle repair manual. A spongy clutch pedal (where the resistance fades as you press down on the pedal) usually shows up in a clutch system with a hydraulic release mechanism. Check the hydraulic system for air. To sum up, bad clutch problems can be as varied as the parts in the clutch assembly. Problems may come from small components like bushings, pilot bearings, springs, screws, dowels; large parts like the clutch disc, flywheel, pressure plate, or release bearing; or even problems in the drive train or chassis. The symptoms outlined here just touch on the most common problems and some potential sources. Still, this list represents a good start in your diagnostic procedure when facing problems with your clutch. Once my car is warm, it is hard to push the shifter into first gear and then reverse. Are my attempts at putting my car in reverse grinding the gears? I've known about this problem in hydraulic systems. If you have this type, try bleeding the system and see if that helps. I heard a pop when I pressed the clutch pedal down and since then the pedal has been spongy but it’s still functioning properly. it doesn’t slip or grind when going into gear, and the slave cylinder and master cylinder are functioning properly before I pull the transmission. Do you have an idea of what it might be? It sounds like one of the cylinders in the master cylinder might have problems. Check first the assembly between the pedal and the master cylinder, and take a close look at the master cylinder. I have a ‘99 Isuzu Rodeo. At first the clutch pedal got stuck to the floor. But after pulling it back up, now is hard as a rock and will not depress. What could cause this issue? There could be a problem with the pedal linkage, or look for some blockage or worn seals in the hydraulic system. Can worn crankshaft bearings crankshaft bearings cause it to slip? Common causes are oil contamination, worn disc, warped pressure plate, bad diaphragm spring, or release bearing putting pressure on the release levers. I drive an Audi and I had to break suddenly and didn't get the clutch down. The car stalled amd now there is a strange noise. What could this be? My car (Suzuku Alto 2008 model) was flooded knee deep and the day after the flood subsided, oil with water was leaking under the engine. It took me two weeks to get a home service mechanic to drain and change the engine oil and get the car running. The problem was there is a squealing or grinding noise whenever I step on the clutch pedal and stops when I fully release it. What is your evaluation and recommendation? 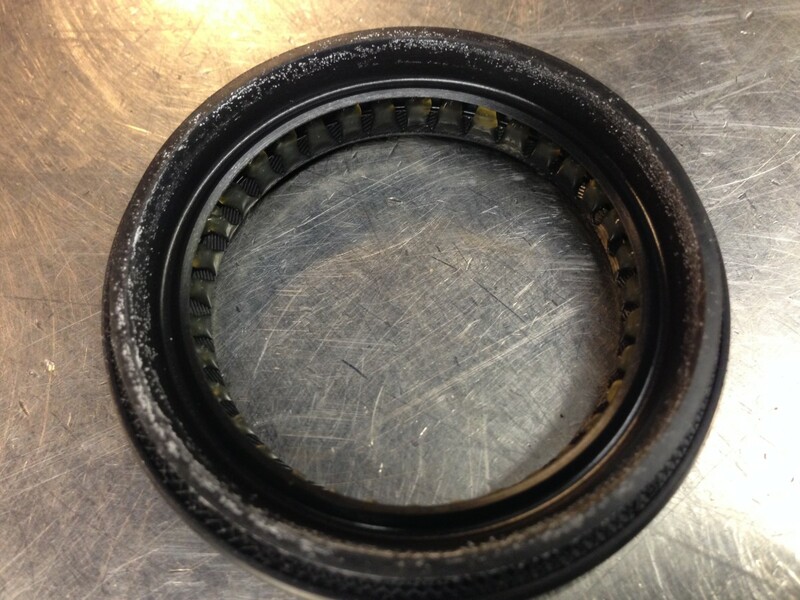 The throw out bearing might be dried out (no grease), and causing the whining noise. Double check with at a transmission shop, but it seems that's the problem. My clutch pedal makes a grinding noise when pushed to the floor regardless of whether the engine is on or off. Why is this? Check the link going from the pedal to the transmission; there seems to be a mechanical failure. I changed my clutch and the flywheel on the 2007 VW Eos and the car started to shake on high speed, and jerks on 2nd and 3rd gear. Why would this be? I drive a 2012 Toyota VVTI van. When the engine is on, it cannot engage any gear, and the clutch makes noise. When the engine is off, everything is normal. What could the issue be? Check the clutch system fluid first, master and slave cylinder. Check for leaks if necessary. Otherwise, there's a problem in the system that needs to be diagnosed. What should you do if your truck motor is racing like you are on the gas but you're not and the clutch is engaged? Check first the idle air control motor (IAC); check operation (direct battery voltage) or with a multimeter. A common issue is carbon buildup inside the solenoid and passages. I Have a 1984 Datsun Sentra. When the car is off, the shifting and clutch pedal is okay. But when I turn the car on, it’s hard to get into 1st and grinds when I put it in reverse. Also, when I’m driving, it runs smoothly, but when I’m in neutral is hard to put it into first gear. What do you think could be the problem? There could be several possibilities here. Check the engine and motor mounts. Sometimes a cracked or broken mount can affect first and reverse gears. The master cylinder can be worn; or air between the clutch master and slave cylinders. My clutch is making a grinding, squealing noise if I let off the gas too fast while driving. What could be the problem? This sounds similar to an issue with a rear differential. It can be confused with a bad clutch. If your vehicle has a bad clutch, check that; perhaps it's a bad pinion bearing. I just replaced the pre-bled clutch master and slave cylinder assembly in my car. Why will the clutch still not engage? This usually happens when one of the lines clogs, causing some residual pressure to remain on the release bearing and this in contact with the pressure plate. You may also want to check the pedal and release assembly for binding or need of adjustment. When I’m coasting at lower speeds, then touch my accelerator, my truck sometimes jerks. Almost like something is grabbing it, then letting go. I slow down with the brakes and it typically goes away. What would cause my truck to jerk like this? This could be due to an ignition or fuel system in need of maintenance. Check spark plugs and wires; check for clogging fuel injectors or an issue in the fuel system. I have a 2013 Dodge Dart. I can shift into all gears without the clutch but the vehicle doesn't move, no grinding noise at all. Is this symptomatic of a bad clutch? You probably have a worn out clutch; it seems to be slipping. Upon Shifting gears, my car is so jerky. Is something wrong, or do I just not know drive to drive it yet? It’s a new used car, and I do know how to drive a clutch. I can't drive up a steep hill. Can this be a cause of a worn out clutch? It is possible but you can also have a clogged fuel filter, partially clogged fuel injectors, bad ignition system components (coils, spark plugs, spark plug wires), clogged cat converter. If your engine has high mileage, compression could be low. What does it mean when the rpms rev up, in all gears, and the car won't go? Probably a problem with the transmission itself, but make sure to check the oil level. In some cases, this could mean a problem with the speed sensor. I have a 2009 Honda Accord. The manual transmission was replaced with a reconditioned one, but it is unable to go into gear when idling. What should I do? The problem could be in the hydraulic system. Check that there’s enough fluid, also. While I hold down my clutch pedal to the floor and the car is in gear, after about 10 seconds the clutch wants to engage. If it’s quick, I have no problems. What would make that happen? It's possible that there's something wrong with the springs. My clutch stuck to the floor, but I managed to get it home. I called green flag and they suspected a master cylinder fault, so we changed it. However, it struggles to get into 1st or reverse when the engine is warm. If I hold the clutch for more then seven seconds the clutch stays on the floor! If the engine is off, the gears shift find and the pedal kicks back up. It’s fine in 2-6. We bled the clutch and brakes after the cylinder change. Do you have any idea what it may be? Hard shifting into first and reverse is “common” in some transmission, but this may also happen when the transmission motor mounts allow the transmission to shift position concerning the engine. They are not properly aligned. So check the mounts and transmission alignment. a bad master cylinder, problems with the slave cylinder, broken clutch linkage, and a failed clutch release bearing. My clutch pedal vibrates and makes a "whoosh" sound when depressed. At first it was barely audible but lately it's louder. My clutch is hydraulic. (2005 Hyundai, 82,000 miles original owner) Time to replace? I have been working on a 3/4 ton GMC Sierra with a manual transmission. We've replaced the clutch components and had clutch slippage; the clutch plate was put in backward, so we had changed that out and replaced just that. Now when putting in gear or press the clutch pedal in, there’s no sound and no grab on any gear at all, like dead silence. What could this possibly be? I’m going downhill on neutral at a 70mph roll and when I try to throw my car into 5th gear it’s really difficult to put into gear. Is it possible that the clutch is bad? Going downhill in neutral is not safe. Do so in gear. You can have the clutch pedal depressed, ready to slow down to prevent gaining too much speed by letting off the clutch. It prevents brake overheat. Anyway, try shifting into 4th gear and see if it shifts. Otherwise, there possibly could be a problem with the sleeves or hubs. My Pajero Sport was jumping and vibrating as I came to a red light. I haven't been able to get into gear while the engines running since. I can move off if I start in 1st but not while in neutral while running. I checked the slave cylinder and it's working properly. Would this indicate the plate is gone? Check the transmission mounts. A bad, loose or cracked mount can cause the transmission to vibrate and prevent engaging into gear. Also, take a look at the shift linkage. My 2005 Cobalt SS runs and idles but when I try to put it in first it won't go anywhere. All the other gears seem to work fine with or without the use of the clutch. There are no grinding noises. What's going on? Try, carefully, pushing the car in neutral. 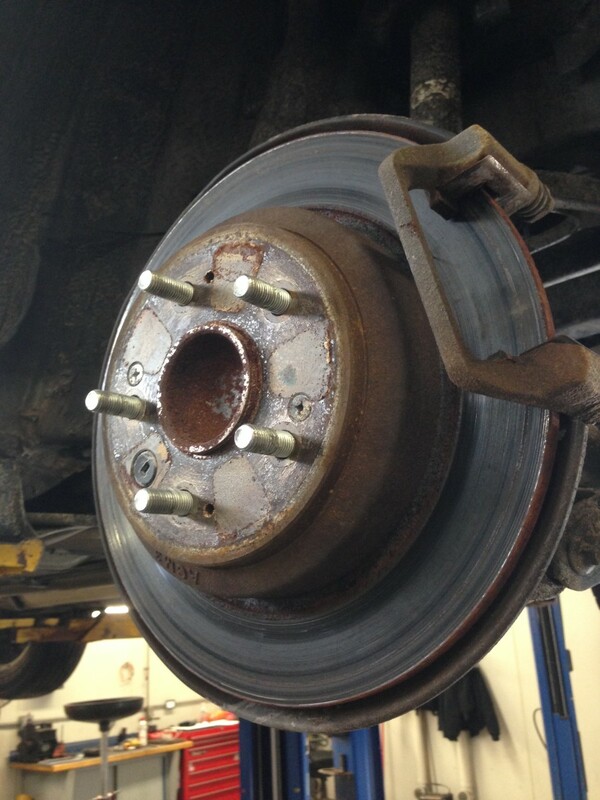 If it won't move, then the issue is with the brakes. If it moves, lift the front wheels and see if they spin. If they don't, then there's a problem with the transmission. It could be locked up. I have a 2007 Mazda 6 6MT. Lately, I started to feel the clutch pedal vibrating with high frequency during operation, and leaving a "tingling" sensation in my left foot after some time of driving in urban areas. I have had the same thing in my E46 320i before. It is not normal, as I do not feel it in other cars I have driven. The clutch seems to engage/disengage quite normally. What could be the cause? Misalignment usually causes this type of problem. Check first the bell housing; then you'll have to inspect the flywheel. Other potential problems could be the clutch disc and pressure plate, or problem with the release levers as well. Is it possible my clutch is wearing out when sometimes, right after I shift and start to accelerate, the vehicle jerks or lurches slightly? There’s a grinding noise upon starting, though the clutch/gears work OK. But the car runs like it's in 4WD even in 2WD mode. What could be the problem with my car's clutch? There could be a problem with the shift motor. Try hitting the motor with a hammer. This may correct the problem for a while. If it does, you may need to replace it. When first starting my truck in the morning, I have to push my clutch all the way to the floor. I do not have an override. After it warms up it is easy to switch into any gear without going all the way to the floorboard. The fluid reservoir is full and there are no leaks that I can see. Do I have air in the system? This could be a problem with the seals in the clutch master cylinder. They may prevent enough pressure buildup to disengage or engage the clutch if they shrink while cold, allowing fluid to leak internally. Once they warm up, they expand and begin to work properly, and pressure normalizes. You may need to replace the master cylinder. I have a 93 F350. Backing my camper up a slight hill or taking off on a slight hill makes the engine want to stall as if it doesn’t have enough power to do so. What could be the problem? Check the ignition, make sure you have good spark - also, the cat could be clogged. When shifting into 4th (and sometimes 3rd) there is bad grinding and the clutch does not engage. I can still use R, 1,2,5 & 6 with no issues. I still have power train warranty but afraid dealer may say it is clutch which is not covered (only 1yr 12K). Thoughts? The grinding noise usually comes from a gear-set that remains partially engaged and another set trying to turn the output shaft. This may happen because of a clutch in need of adjustment or a clutch or gearshift linkage binding. However, since you are having problems with 4th gear and sometimes 3rd, I’d be suspicious of a worn or bad blocking ring in the synchronizer. Both of these gears share the same synchro. Another remote possibility, if you replaced the transmission oil, you may have used the wrong type. How can I tell what caused the heat spots around the clutch? I don’t think it was driver style. Other than driver style, the most common causes are a binding linkage, oil or grease contamination, or bad clutch adjustment. I have a 2007 Mustang. When I’m in first or second and the rpms are high, the car makes a scraping, whirling noise. Additionally, when I’m in neutral, it’s noisy until I press the clutch in. Is this caused by the same problem? This sounds like a faulty release bearing. When bad, they make a grating, whirring, or grinding type of sound. They usually become noisy in neutral, but sometimes you can hear them in gear. My clutch has to come all the way back up to engage. Does it need adjusting or replacing? Everything else works fine, shifts properly and everything. 1st gear is tricky though, with it letting out so high. My clutch started squealing when ever I pressed the pedal down. Now the pedal is really stiff to push down. I've got it booked in at a garage 8 miles away but I am worried about getting there. How's best to drive it? There is an airy sound when driving and, as soon as the clutch is in, it stops. And I ask, why? My MG3 clutch pedal doesn't return quickly when depressed, but this only happens after the car has been driven for a few minutes. When the car is cold, the clutch is normal. It's only a problem with the pedal. There is no problem with changing the gears and no noises. What is this likely to be? You may need to bleed the system, but it could be a problem with the master cylinder and/or slave. What will make my car have loud spinning noise when I let off the gas pedal? And why does it not go into reverse? When I slip my clutch under load, it makes a loud whirring noise until it's fully engaged. When I'm slowly releasing the clutch, it doesn't make a sound. Is it my pilot bearing? It seems like there's a problem with the release bearing. I am driving a Hyundai I20 2010 model. When I press in and depress my clutch plate I hear a growling sound. What might be the problem with my Hyundai's clutch plate? This could be a worn front or rear bearing on the intermediate shaft, or output shaft rear bearing. My truck died, and I went to restart it, but the clutch just fell to Ground? The truck starts every time, but it is unable to go into gear. What should I do? I have a 1995 Mercedes-Benz W124, and when I press the clutch pedal it gets stuck and won’t come back up unless I pulled it up. But after pulling it back up, it gets stuck on whatever gear I was on. Is this a spring problem? There could be a problem with the hydraulic system. 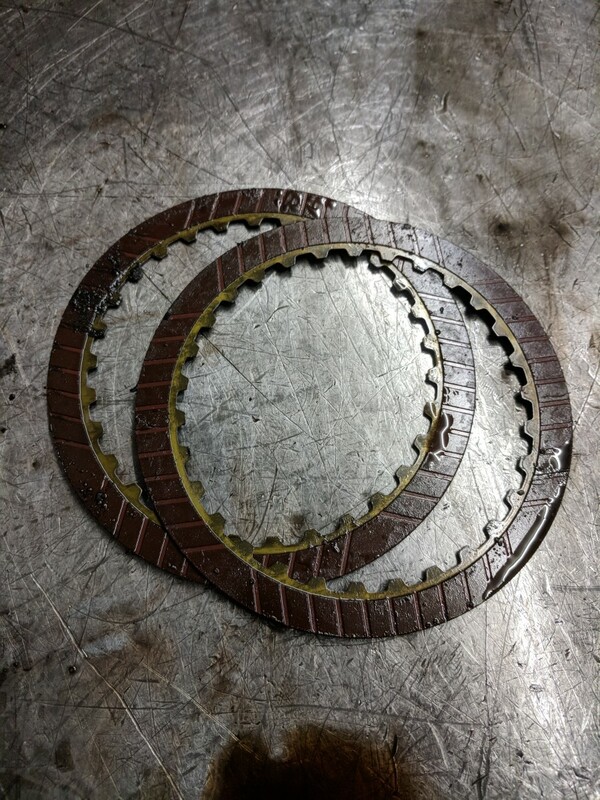 If you’ve never replaced the clutch, this could be a problem of a worn out clutch and pressure plate. When I accelerate, I feel a kick-out movement in front under my truck. Is my transmission bad? My mounts also feel bad even though they were replaced. It's possible, but a common source of such problems are the U-joints and wheel bearing, or low or contaminated transmission fluid. Check these first before blaming the transmission. When replacing the clutch, I noticed two springs were broken in the clutch. Was this caused by no lubrication on the input shaft? I've just had a new clutch, flywheel and reconditioned gearbox installed. It's a 2011 Vauxhall Movano. The truck drives worse than before. There's vibration on idle. Sometimes it won’t go into first gear, and there's a constant whining noise. What is my problem here? 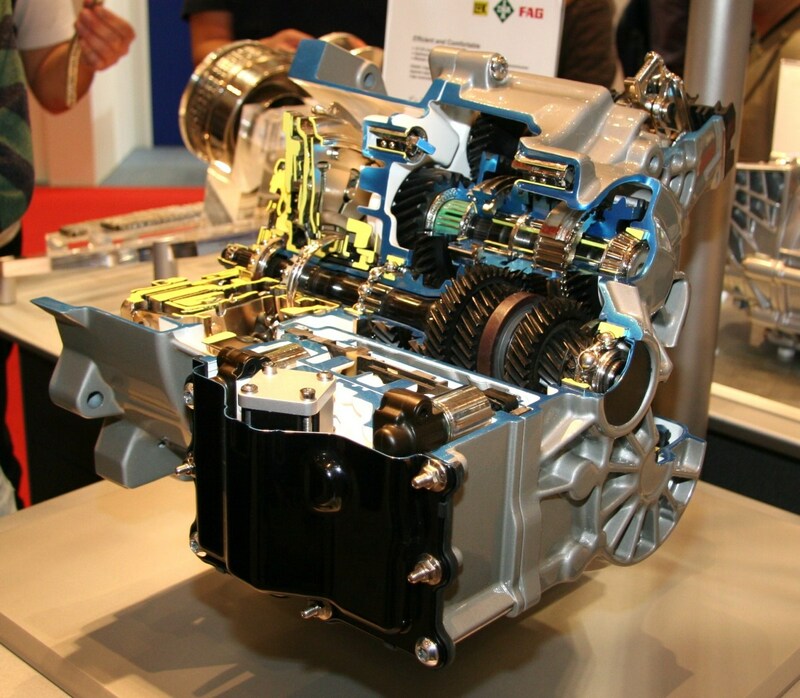 It's possible the transmission or gearbox is not correctly aligned. Check the transmission and motor mounts for damage as well. I was driving last week and as I took a turn I heard a banging noise and afterward the car didn't want to drive further, even though I can still easily change gears. I am driving a 2012 Chevy Aveo 1.6 manual transmission. What do you think the problem could be? Check the fluid level, make sure there’s enough. But probably the shifter or linkage isn’t connected, may be that’s the bang that you heard. See if you can check from inside; remove the shift boot. You’ll probably need to check the shifter assembly. If isn't accessible from inside, you’ll need to lift the vehicle. I pressed the clutch and shifted into neutral. When I released my foot, the clutch stayed down. I waited and it didn't come back up. Then, I revved the engine and the clutch pedal immediately sprung back up. What could have caused that? If you have a hydraulic system, the seals in the master cylinder may be bad. If so, it’s a good idea to replace the whole part instead of replacing just the seals. Also, there could be a problem with the release bearing or linkage. I can't select gears. I have replaced the master cylinder. What could be the problem? Make sure you've benched bled the master cylinder before installation, then bleed the system to get rid of air. If everything is correct, one of the lines could be leaking or problem is with the slave cylinder. “Worn or bad blocking ring in the synchronizer” Are these parts considered part of the transmission (which is covered by warranty) or part of the clutch (which is not and I’ll have to pay for)? This is part of the transmission. I had a new clutch kit fitted and slave cylinder. Now I heard a noise setting off uphill. What could be the problem? 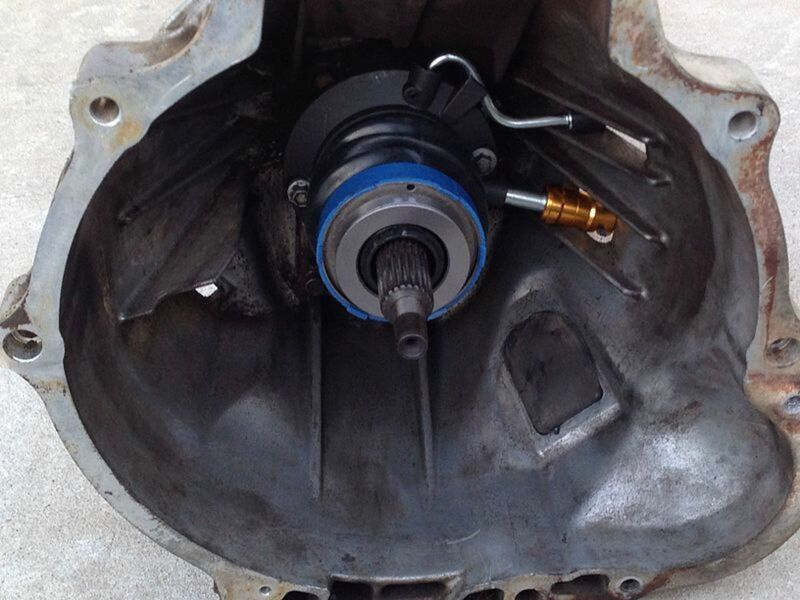 If the noise is in the transmission area, and assuming a proper installation, there could be a problem with the clutch release and input bearings, pilot bearing or bushing. Why did the clutch pedal of my 2007 Mazda6 sink to the floor and never come back up? There could be several reasons for this like air in the lines, clutch release bearing issues, or a bad slave cylinder. Check the fluids first. I have a 2001 Nissan Sentra with a manual transmission and is front wheel drive. I recently found my car stripped of all 4 tires and had to replace them. After replacing the wheels my car will go into gears but will not move. It tries to inch forward and even tries to go in reverse. The gears are definitely engaging because there was power going to wheels and I could also get it to stall while in gear. What could be the problem? Sorry to hear about your stolen tires. If the transmission seems to be working fine, and the car feels like it wants to move, the problem could be a seized brake caliper(s), damage to the CV joints or shafts. I had a new clutch replacement 3 weeks ago on my Mazda 2. I was driving it today and it doesn’t feel right at all. Every time I change gears the clutch sticks. Any ideas what it could be? I'm having trouble with my truck. I can't get it into a single gear, even while the engine is stopped. Can you help me? I have a 1992 automatic f150, when I start the engine it’ll idle low, to the point of almost cutting off. Then rev back up and eventually even out after a min or so. Then I went to put it into reverse, and nothing happened. I put it in drive, and I felt it lock into gear, so I put it back into reverse, and I felt it actually go into reverse. Does this sound like a transmission or possibly a clutch plate problem? It's hard to tell without some tests, but first, make sure there are no diagnostic trouble codes that can point you in the right direction. If there are no TC, a pressure test (for the hydraulic circuits) may be necessary. This will check for a restricted inlet filter, leakage in the pump, sticking main regulator valve, damage to gaskets, and other issues. I just put in a new clutch. The rpms drop really low taking off in first, and I have to push in the clutch a couple of times to keep it from stalling. Then all of a sudden the rpms stay up, and I'm good to go. What could be the problem? Probably the ECM was reset when the battery was disconnected. It may need some time to readjust. But also check the IAC valve, MAF, or for a loose/disconnected vacuum line. What does it mean when my car loses power completely? I don't know if it could be a problem with my clutch being old or something else. Make sure to get the computer codes and see if there're any pending codes that can give a clue about the problem. I have a 2005 Ford Focus ZX4 ST, I cannot feel any gear slots when moving the shifter while the car is running or off. What could the issue be? Check the hydraulic system. There could be lack of system pressure preventing the clutch to engage. I have a ‘07 VW Jetta, and the only gear I have is reverse. And that's only when I manually engage under the hood, while the car is running. Clutch pedal seems fine, but I can't get or find any other gear. I had issues with the linkage before and was adjusting it myself. But over time, slowly lost gears. Now I have none. Also, the check engine light came on after smelling a burning clutch really bad. And then after that totally lost gears. What could this be? Probably the release bearing was too close or touching the pressure plate release lever when the clutch was engaged. This is usually due to a maladjusted clutch linkage. Lack of clearance accelerates clutch plate, pressure plate and release bearing plate. I hear a slight clicking noise as I begin to take my foot off the clutch. The click sounds almost as if something is sticking but then releasing. Any idea what this could be? There could be a problem with the clutch release bearing or pilot bearing. You need to have it diagnosed first to make sure it’s coming from the transmission. I have a 2009 Corolla, and now the engine seems to make a noise, similar to that when you reverse a car. It does this mostly in gears 1,2,3 and 4. Would this be the clutch? The clutch has been over a year old now since replacement. The clutch point is much higher on the clutch. However, it holds the car and hasn't had any actual problems there. It is just this recent noise now. What do you advise? There could be a problem with the clutch linkage adjustment, and usually, you can notice it because of the amount of clutch pedal play. Check that first. These type of noises usually come from worn out bearings and bushings. For example, a worn pilot bushing will make a squealing or howling noise when depressing the pedal. Hope this helps. I have a 2009 Jetta. When the clutch pedal is all the way to the floor it makes a noise. When released just an inch or two it does not make a noise. Everything else seems fine. What could cause it? Probably the release bearing is going bad. If you depress the pedal all the way to the floor, shifting to Neutral, you can hear it, most likely is the release bearing. While driving in the 3rd gear, my car sometimes gives up, i.e even if I have pressed accelerator. Also, the speed reduces. Then I have to remove my leg from the accelerator and again have to press it. Is it because of the clutch plate? Doesn’t seem likely. Here are just some possibilities: check for knock, intake vacuum leaks, exhaust leak, clogging fuel filter – something leading to a lean condition. I have a 05 Chevy Silverado. When I back up and then put the truck into first gear 8/10 times, it will kick out of first. Also while driving down the road if I do not hold the shifter in 5th gear, it will kick out also....and on top of that I have to slam it into gears at a time. Is it a bad clutch or bad transmission? Sometimes, the problem is with the linkage (check for adjustment), but it can also mean problems with the transmission - worn bearings, shift rails, synchronizers, or problems with clutch gears. Just out of curiosity, make sure motor and transmission mounts are good. I've seen bad mounts mess up, especially with 1st and 5th. My clutch pedal was fine but after being parked for 2 months, it became stiff and would not release. I took it to a garage, who said it needed a new clutch. After waiting 2 weeks, they put the clutch in and then said the master cylinder was seized, which was what I thought it was in the first place. They had my van for 5 weeks and are now charging full price for everything, including diagnostics! What are your thoughts on this price for these repairs to my van's clutch? If you initially signed for a specific job, then that's what you should pay for, unless you authorized for them to do some extra work. Paper work should include the initial diagnostic. But some shops may not work this way except for a verbal agreement and will do the paper work afterwards. So it depends how it was worked out. As for the real cause of the problem, a sticking or hard clutch usually mean problems with the linkage assembly (cable or hydraulic linkage-- depending on model) or pressure plate (more rare). But it's hard to tell without a correct diagnostic. My car is losing power and the gears seem to be misaligned, what could be the problem? Make sure there's enough oil, otherwise the linkage may need adjustment or the clutch could be worn. I have a Ford Fiesta 2009. My car does not shift gears after changing the clutch plate. When the engine is on and I clutch to change gears it won’t. What could be the problem? Probably the engine and/or transmision mounts are loose or damaged. That'll cause the engine/transmission to twist and, sometime, cause damage. while I was about to put my hyundai accent into reverse, I heard squinking sound and the timing chain cover broke, the engine shift forward and damaged some other things in the vehicle. It could be a problem with the linkage or an adjustment issue. Plate not engaging until the pedal is completely release. I use a nissan primera old model car. When i engage the car, d car wont move until i release d clutch totally. Also d car give a sound like an automatic while trying to accelarate. I just change the clutch plate nd pressure plate recently. What could the problem be pls? Probably the clutch linkage needs adjustment. The release bearing is too close to the pressure plate release levers. That's why you hear the weird noise. Check the linkage, and see if you can adjust it. First make sure there is not too much pedal play. On some models you can adjust the pedal. Then, raise the car and check the clutch linkage for problems. Otherwise, the problem can be with the transmission or clutch assembly. My car moves when i start it on gear even when the clutch is pressed to the floor. What is to replace here? It depends on the particular system, but this can happens because of low fluid (hydraulic clutch); loose clutch cable or damaged cable; failed master or slave cylinder. Hope this helps. 3 months ago from ???? Thanks for the informative article about the car's clutch. It could be a vacuum leak, sensor problem or pressure issue. Scan for trouble codes, even if check engine light not on. Sorry I can’t be of more help. Take a look at the shift linkage cables, there could be some binding. Sorry I can’t be of more help. I have a Hyundai H1 bus 2011 model. I’ve installed a new clutch kit, clutch slave and master cylinder. I am still having difficulties in shifting on low gears and reverse. Please advise on where it may be causing this issue. Make sure there’s enough fluid. Other possibilities is the a linkage problem or an issue with the syncro. I started noticing issue when I am trying to engage 3rd gear, it is not smooth but all other gears are ok and my ecosport diesel is new car. Please advise. It's possible you got a transmission fluid issue. Call your local dealer and ask what type of transmission fluid you should use for your particular model and check if you are using the same; otherwise, replace it. Hope this helps. MY SUV ADVENTURE MODEL 8 YRS PAST, HAD CLUTCH REPLACED. BEFORE IT WAS NOT REPLACED, I FELT FIRST GEAR SLIPPING BUT NOT BIG PROBLEM BUT MY WIFE DECIDED IT TO CLUTCH REPLACED. HOWEVER, AFTER LONG DRIVE GEAR SHIFTING IS DIFFICULT TO ENGAGE WHY? WHEN COLD NOT RUNNING FOR DAYS NO PROBLEM OF GEAR SHIFTING WHEN RUNNING LONG CAN'T SHIFT ANYMORE? WORSE WHEN BACKING GEAR WON'T ENGAGE ANYMORE? That problem seems to come from the transmission, possibly worn out clutches and other worn out components. Have it properly diagnosed before deciding on a repair. I think you should take it back to the garage and have them look into this issue. It can become rather expensive taking the car to a new shop and have them fix the problem. It's, after all, the first garage who messed up the clutch system, apparently. At least they should take the car to another garage if they can't fix it, and they should pay for the repair. It's happened before, more than once to other shops. That's my personal opinion. Hope this helps. Can you help on this topic? I recently had my Audi A4 2 litre turbo engine replaced on a 2009 model ( it had seized following impromptu failure of oil pump). The garage didn't inspire confidence when it overlooked to plug in the alternator and the battery failed. I then had to take it back yet again when it became difficult, and then impossible, to engage any gear. On its return, and being told that the fluid had to be encouraged to circulate, I have noticed that the clutch pedal has a "floppy" mind of its own and engaging first gear is stiff and certainly much less smooth than it should be or was before. I'm a bit embarrassed by taking it back yet again and am thinking of going to a fresh pucker garage to get it done once and for all. Cheers. P.
Make sure the noise is coming from the transmission - one way to do this in most cases is to put the transmission in Nuetra, disenagag the clutch and let the engine idle. If the noise stops, it's more likely inside the transmission. If the noise is occurring in Neutral as well, suspect the roller bearings on the input shaft - these are the only ones turning when in Neutral, and probably cause it in gear as well. Hope this helps. It's possible the clutch is worn (won't engage), but make sure there's enough fluid in the hydraulic system and no air- check the clutch master cylinder. Please, why can I shift gears but can't accelerate. Ford freestyle 2007 acceleration doesn't work even when I shift to drive (D), It only raise like its on neutral even when it on drive or reverse. first, Did you check there's enough fluid in the transmission - and make sure the fluid is not contaminated. I would think there're some binding problems with the shift forks or selector plates, or even a bad pilot bearing as you mentioned. But you seem to have the problem only moving from a dead stop. So there could be drag from pilot bearing. Sorry, can't help you much here. I often have a very hard time putting it into gear from a dead stop (any gear R through 6) right from clutch in. --If i clutch in and quickly try to engage a gear, the car will roll a little as transmission inertia is taken away by the synchro locking up. However, it won't enter the gate. --With the clutch in, if I hold the shifter at the gate lightly for several moments, the gear will eventually engage as everything stops spinning. Racing the engine to 3k RPM appears to help somewhat, but results are inconsistent. --Alternatively, if leave the clutch in until everything stops spinning (5-10 sec), the gear will engage. However, at stop lights and traffic, this can be problematic. --Also after coming to a stop with the clutch in and a gear still in gate, it can be hard to shift out of the gear into neutral. I don't have apparent grinding or shifting issues while the car is in motion or when the wheels are free to spin. I have ruled out clutch drag due to pressure plate. I put the car in both first and reverse with the clutch fully depressed. I revved the engine out to near redline on a level surface (my garage), and the car did not budge. --With the parking brake off and clutch in, the gear engaged smoothly. At first the wheels only spun a few revolutions, but quickly came to a stop. ----However, I also began to notice intermittently that the wheel would continue spinning while in gear with the clutch in at idle engine speed. This did not occur on every engagement, but occurred often enough not to be a coincidence.Also, wheel spin would occur at the same rate/sensitivity regardless of how far past the friction point the clutch was pushed in. In other words, the drag appeared to be consistent across the dead throw depth. ----Nuance with this incidence: when racing the engine, wheel speed did not increase appreciably or would decrease momentarily until RPMs returned to idle. Sometimes, the wheels eventually come to a stop spinning after racing the engine. This might explain why primary clutch drag tests turned out negative. Based on these conclusions, I might be observing some drag due to the release and/or pilot bearing? Hopefully you just did some wear-and-tear on the clutch. Those gear are not exactly built for this kind of job. And, it was only for 5 seconds. So probably there was no further damage. I tried to tow from a ditch a heavier car for about 5 seconds with my 1996 Volkswagen Transporter and I noticed a burnt smell from the clutch. Did I broke my clutch, or made some wear-and-tear on it or what happened? Is it something I should be concerned now? Thank you in advance for the answer. There could be several possibilities here, and perhaps more than one issue. Make sure you have the correct pedal travel, if out of adjustment, this can make it hard to shift (disengage). And just to make sure, check that the shift cover is not loose. Make sure the transmission has enough lubrication and not contaminated -- check for possible leaks, if necessary. Check the shift linkage (adjustment, lubrication, damage?). If there's a particular problem (grinding noise) working the reverse, I'd suspect a sticking input shaft clutch pilot bearing. The clutch pedal has been hard since i bought the car 6 months ago. Recently I noticed the clutch pedal began to make noises (pretty sure it is from the pedal) and it became harder to shift into gears when the gearbox/engine heated up (assuming it's when they heated up, because it was after driving for a while). When shifting into reverse the gearbox did a cringy grinding noise and that has become worse. Sometimes driving normally makes the gears grind a bit aswell (not as bad as the reverse gear). Something that can work sometimes (after driving for a while) is, when i come to a dead stop, I put the car in neutral and pump the clutch pedal a few times. Afterwards I can easily slide it in first and then as easily slide it into reverse. I'm pretty sure the clutch does not disengage when pushing the clutch pedal. Even when starting the engine with the pedal depressed, the car starts moving forwards/backwards depending on which gear I start it in (meaning the engine is connected to the wheels). The clutch itself does not slip whatsoever. I've done the test where you put the car into 2nd and lift the clutch with the handbrake on. The RPMs drop, or the car moves forward a few inches. In gear the car is revvy and happy, without any slips, even at 7000 rpm in 5th/6th gear. What may be the cause of my problems? I've taken it to a mechanic (which I previously know is not the best mechanic), who said I should just change the whole clutch. I told him I thought the issues lied in the hydraulics, either air, fluids or hardware being the issues. He neglected the fact that air could enter a hydraulic system so I just left. The car is a FWD, 2005 Honda Accord (euro-spec) with about 87k miles on it. Sorry for the long text, but I wanted to make sure I get all the information needed in the question. This usually points to a throw-out bearing that's starting to wear down. A worn pilot bearing can also make this noise as the pedal is being depressed, but is not as usual. This is most noticeable in 4WDs. When I put my foot slightly on the clutch I makes a little noise but goes when I put it fully down. I can drive car normal and don't loose power what sort of issue is this. Or there could be problems with the clutch linkage binding, borken parts) or clutch assembly components. A variation of this is to drive in fourth, and without letting your foot off the accelerator, depress the clutch pedal all the way in and then release the pedal. 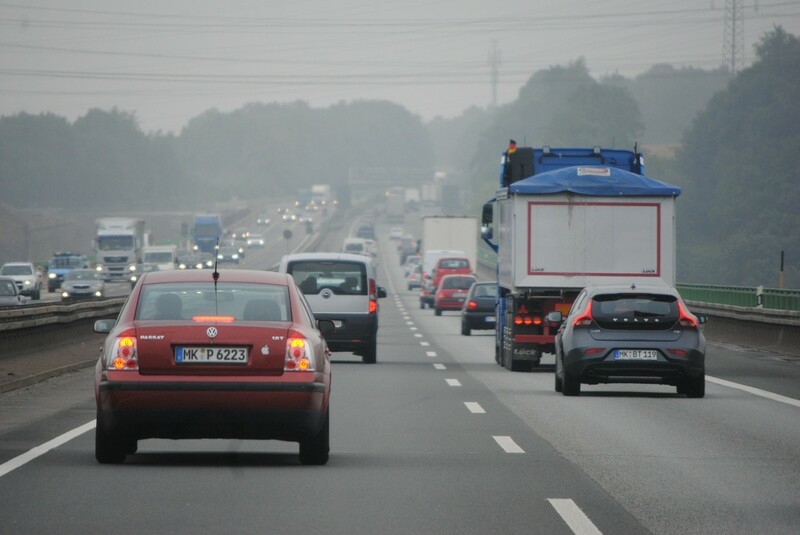 You should notice a change in engine speed (decrease); otherwise, the clutch is worn and not engaging correctly. My 2012 Chevy Cruze 1.4t in 3rd and 4th under hard acceleration up a slight hill seems to start to loose power as the rpm goes higher rather then pull like I’m used to. I tried driving at 40 in 6th, seeing if it stalled in the drive way and also hard acceleration everywhere else. None of those tests show signs of a bad clutch. I can’t seem to mimic the issue that happened twice to me. I don’t really smell anything besides the brakes when stopped and I open the hood. No noises or anything. 74k miles and almost double the stock power on original clutch, I know it’s going to go bad just don’t know when. Any other tests I can try? Check the clutch linkage adjustment and also make sure you are using the correct oil for your application. It certainly was a factor. Improper hydraulic pressure is like not putting enough lubricant. One think lead to another. 9 months ago replaced engine on Scion Xb. Transmission components also replaced. When reinstalled, hydraulic line bushing was not screwed properly - only 1 of 3 screws used. After 6 months, had trouble shifting in low gears. Discovered bushing problem. Part of unit that holds bushing was broken, so I could put in only 1 more screw. I assume vibration from improper install of bushing caused break. After clutch worked for 3 more months. 2 weeks ago I had trouble w/2nd gear slipping. Then 2 days ago hydraulic line failed and clutch PP overheated, dead. My question: did improper line install lead to failure? Getting rid of air bubbles in the system can take some effort; make sure there's enough fluid in the system. You may need to bleed it a couple more times. Hopefully it's just a fluid level issue. Otherwise, it seems there could be a problem with a solenoid or a similar electronic device. Old electronic components tent to becomes more sensitive to heat and begin to fail. Once they cool they begin working again. You may need to have a shop do a diagnostic before start replacing components. My car works just fine when the engine is still cold but after around 15 minutes my car won't go into gear. What might be the problem? make sure there's enough oil - do you need to change the oil? - check the service schedule. Usually, hard shfiting problems point to internal components, hub sleeve, gears, synchronizer. Hi....I''m driving Golf 4 Gti, my car is struggling to select gears and the pedal is flat down and there's no smell of failing clutch or slipping.......what might be the problem. Have you checked the clutch pedal. Check the hydraulic system as well. Hard to tell without some diagnostic but one possibility is the shift mechanism. Have a Honda Element with 127,000 miles. Not sure of previous maintenance but hearing a click when driving and pushing in the clutch, both accelerating and braking. Seems to be getting more prevalent. Any ideas? Probably the clutch isn't engaging or disengaging properly. Maybe the fork came out of its seating position against the throwout bearing. Make sure the master cylinder is working fine first, though. There could be several reasons for the noise, assuming it is rattling there could be a loose part, usually a pulley in an accessory or belt, or a cover like a heat sheild. But you may be dealing with a broken motor mount. Hard to tell if this is linked to the reverse problem, but this would have to be diagnosed in a shop, you may have a problem with a band, or solenoid actuator in the transmission. good day i am driving a 1 series BMW 2008 model. my car has a noise when is in neutral and when reversing it struggles to go back. If your car has an hydraulic system, you may need to replace the fluid or bleed it. Othewise, the pedal mechanism for wear. You may need to separate the transmission from the engine for inspection. Good day ,Clutch sleeps on the floor now and then and as well the car rev counts when i engage the clutch.